Minifogger�with Multi-Directional Fogging Head.� In Stock For Immediate Delivery. Minifogger with Multi-Directional Fogging Head. In Stock For Immediate Delivery. Measures 15.75" tall (with fogging head) x 11.75" in diameter. Dry weight is 12.75 lbs. Coverage depends on humidification requirements and ceiling height. Output is approximately 0.4 gallons per hour. Circulates 173 cubic feet per minute (cfm). Industrial-Grade Motor. Standard Voltage is 115V/60Hz (Fits into standard three-prong outlet). Power consumption is very low--0.9 amps. Voltage of 230V/50Hz is also available for non-U.S. customers. Comes with internal float valve to maintain proper water level. Connect directly to your water supply with either our Water Installation Kit, Gravity Feed Water Kit, Garden Hose Connection Kit, or your own hookup (you'll need 1/4" tubing). Reservoir Pan Capacity is 1.8 quarts. Operates at 62 dBA. Humidistat optional. 1 Year Manufacturer's Warranty. Oversized Box; Dimensional Weight of 22lbs applies. Shipping & Handling is $28 anywhere in the Continental U.S. Consider adding our Humidistat to accurately control the level of humidity in your desired area. Also, our BioCubes will inhibit the growth of bacteria inside the humidifier for a minimum of 6 months. 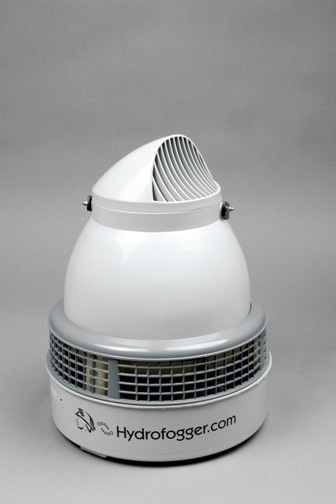 Our Minifogger Air Filters will remove dust and dirt from the air entering the humidifier. In Stock For Immediate Delivery.